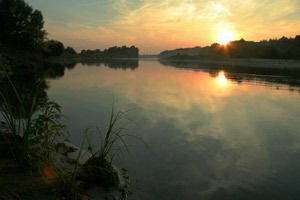 Desna River is the largest tributary of the Dnieper River. Desna joins the larger river from the left, about 6 km before the Ukrainian capital Kiev. Desna River springs from Smolensk Heights, which is situated in the area Smolensk Oblast, in Russia, then heads south to Ukraine to join the Dnieper, before Kiev. The length of the Desna River is 1130 km, whereas the mean drainage basin has a size of 88, 900 square kilometers. 591 km of its length enter the territory of Ukraine. Once departed from Smolensk Heights, Desna heads to a low wetland valley, formerly known by the name of Briansk. In this section the right bank of the river is considerably higher than the left. A little further on, Desna River merges with Seim, and its bed significantly expands and thus cuts the number of overlapping sleeves. Desna goes low past the city of Chernihiv, divided by one of its tributaries - Oster, and remains on course to calm Ukraine. In his Ukrainian section, Desna reaches a bed width of 60 to 250 meters and its average depth is 3 meters. Usually it freezes from early December to early April, leaving it still navigable by Novhorod-Siverskyi, at the mouth, which has a length totaling 535 kilometers. Desna River is formed along its 18 left and 13 right tributaries, the largest of them remaining Sudost, Snov, Seim and Oster. Along the river Desna larger cities are Zhukovka, Bryansk, Trubchevsk, located in Russia, and in Ukrainian territory are Novhorod-Siverskyi, Chernihiv and Oster. One of the sights that you can see along the river Desna is the Svensky Monastery, which is located at the merger of the river flow with Svin. The monastery is only few kilometers from Bryansk. According to legend the monastery of Desna was erected where a miraculous icon has cured the son of Saint Michail of Chernigov, from blindness - Roman.